While the coast and islands of the Whitsunday region take up all the attention of visitors to the region, the interiors also have marvels of nature worth exploring. The Proserpine River Wetlands are home to many native birds, animals and more specifically over a hundred estuarine crocodiles. The saltwater estuarine crocodiles fondly called “Salties” are known to be the most dangerous in the world. Proserpine Eco Tours conducts leisurely safaris through the wetlands and cruises down the Proserpine River. The campsite located on the banks of the river is the start point for all the safaris. The tour includes Return courtesy bus transfers from Airlie Beach. Bring a hat, mosquito repellent and sunscreen. Toilet facilities are available at the campsite. Beverages and souvenirs can be purchased at the campsite. Child (aged 1 - 14 years) - $60 AUD. Tour times are set 48 hours prior to the tour or at the time of booking. How popular is Whitsunday Crocodile Safari? People normally also visit Cedar Creek Falls while planning their trip to Whitsunday Crocodile Safari. If you come to the Whitsundays don’t miss this tour it’s a great family day well guided informative and educational. Mark & Tom are true wildlife warriors made us all feel welcome. 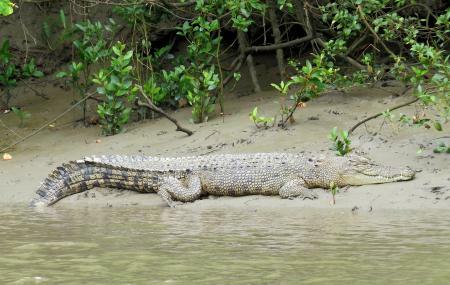 Saw some great sights and a few crocs especially one sunning herself in the bank. Don’t miss this experience. Also the food is amazing. Damper at the end is first class. We visited the park today....I have to say it was really entertaining and informative. Oh...the food was great and plenty of it... Great day out! Just want to state that the staff on this tour were so lovely and knowledgeable and I could not fault them . However we did not get to see any large crocodiles ( only some very small ones ) I absolutely understand that this wildlife and it does not play out sometimes the way it should, that said they explained that this time of year due to the females nesting and that it’s very hard to see them so I would think that the company would offer a special price as essentially we paid $110 to see 2 small crocks one wallaby and a tree snake ( which the awesome guide manage to catch ) and the barbarcue which was lovely by the way . Considering we were a family of 6 we were quite disappointed! Never mind ! Thanks for all the information about the bush and the wildlife. Was pretty good but the area is so dry and hot that you don't see as much. Apparently winter time is the best time to do the safari, will definitely do it again when the weather is a bit cooler.